You can purchase a downloadable pdf version of this pattern HERE. 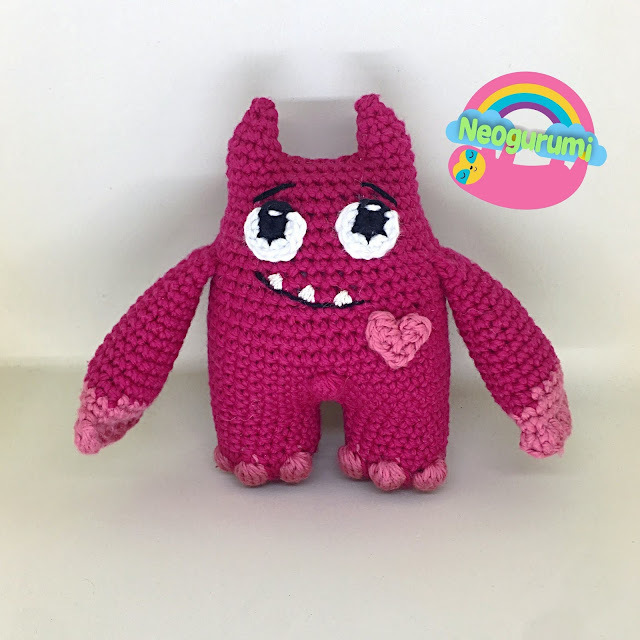 Size: 6” tall when made with the suggested yarn and hook size. Step 1: Yarn over, insert hook into st, yarn over again & pull up loop, yarn over, draw back through 2 loops. Step 6: Yarn over, draw yarn through all 6 loops on hook. Make 2 – starting in dark pink. R14: (Sc x 7, sc inc x 1) x 2 (18) Change to pink. FO the 1st leg but not the 2nd. Continue to the body. Make 1 – in dark pink. Continue from the 2nd leg. FO, leaving a tail for sewing. Close up the ear and hide ends. Stuff the body, head & add some stuffing to the ears also. Once finished, sew across the head in a straight line to close. Make 1 – starting in black. R1: Sc x 7 in MR (7) Change to white. R2: Sc inc x 4 (8) Partial round. Add a white highlight to each eye then sew to the head. FO, leaving a long tail for sewing. Sew to the back of the doll. R1: In MR, ch 2, dc x 1, hdc x 1, sc x 1, ch 3, sc x 1, hdc x 1, dc x 1, ch 2, slst x 1. Pull the MR closed and then sew to the front of the doll. I hope you have enjoyed making your monster as much as I enjoyed designing him. Please feel free to contact me if you need any assistance with this pattern.